You've been asking, so we've delivered! Here you'll find our sleek and convenient slider tins. 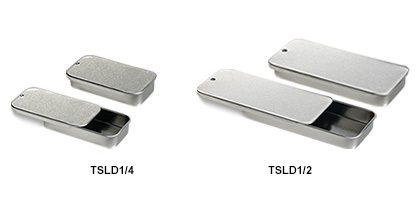 Available in two grab-and-go sizes, these durable slider tins are a nice alternative to round tins. The rectangular shape fits nicely in the palm, purse or pocket. These tins are food grade and can be used for a wide range of cosmetic, grooming, or mini food products such as mints.